That was one hell of a show.. just saw Los Lobos at the Fillmore. Via funos, the mail order operation apparently started by Dr Clayton Forrester's cousin: United Nuclear. Be sure to scroll down to the "Looking for some URANIUM?" image on the left. Have some paper weasels, courtesy of Yamaha and momentrabbit. Quote for the day from austin_dern: "Numbers 25 through 30 are 'VGO G5 Dual Power Rhythmic Massagers', which are flexible instruments of torture and also Mac OS X-compatible." Oooh.. Studio Ghibli's announced their next project: Gedo Senki (Gedo War History). "Directed by Hayao Miyazaki's son, Goro Miyazaki. The film will be an adaptation of Ursula K LeGuin's 'A Wizard of Earthsea', and will be released in Japanese theatres in July 2006." And here's the poster, suitably recompressed for easy dialup loading. I really hope they come out with a trailer soon. Even for a Ghibli production, this could be positively gorgeous. And all dragony. No :( We missed it when it was briefly on at the cinema, but I've got it on the list of Dvds to Buy When My Next Student Loan Installment Arrives (need to find a shorter name for that list). Hopefully be able to get most of the Ghibli dvds as they're released next year. "I want to change my Christmas list. As it seems you will never get me Sir Sean Connery although I ask for him every year. I would like instead a cute fuzzy Hondo Stoat and a chunk of Uranium"
I wonder how difficult uranium refining is..
.. but, no, I think my Mad Scientist calling involves lasers rather than radioactivity. You? Genetic engineering. I wish to laugh in the face of God! Oh, huh, another book adaptation? o.O I wish they'd write some new material though... still, it'd be nice to see that book put into anime form. 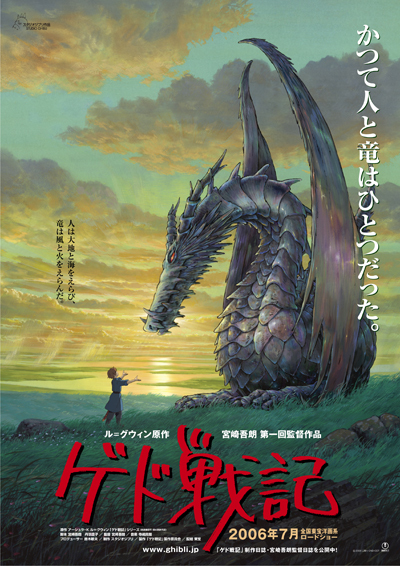 Ghibli doing A Wizard of Earthsea? I think I just melted. What happens if I spread you on me now? Sam and Max as in the ones from the classic game? I loved that game. Yep! Lucas had a second Sam & Max game all but ready to release in 2004, then cancelled it, for reasons known only unto the manglement. So the core developers split off to form Telltale Games, who managed to pick up the rights to Sam & Max (the characters, not the dead game) as that option expired. "Telltale will work in close collaboration with Steve on the Sam & Max releases. Sam & Max are very near and dear to Steve, so he will be very involved in the projects. Although he has a “real” job Steve feels a deep moral obligation to see to it that only the highest quality Sam & Max crap be dispersed into society in an effort to confuse and alarm our most impressionable young citizens." Ooh.. I see a t-shirt I must have. ^_^ And prints too..